There is a problem in our Churches today and it’s called, Biblical illiteracy! According to a recent ABC poll, up to 94% of high school students stop attending church after graduating because of Biblical challenges and stagnation of their faith. Additionally, over 50% of all weekly churchgoers are not Christian! Christians are not mature in their faith because many professing Christians do not even know the basics of their faith. According to the results of a survey conducted recently by LifeWay Research, over 3,000 participants were asked a set of 47 questions about foundational Christian beliefs. Most of the answers revealed a mishmash of heresy and confusion about Christianity’s most basic doctrines. It’s not just the departures from these historic doctrines that should concern us, but the contradictory answers. It shows that Americans in general, and evangelicals in particular, are clueless on basic Christian doctrine. This is the basis for Christian Basic Training (CBT). Every year professional athletes attend training camp to get back to the basics of their particular sport. Regardless of their previous successes, they review the fundamentals (hitting, fielding, base-running, blocking, tackling, special teams, etc.) of their profession to insure that they have a solid foundation in which to excel. Most games are won or lost because of a lapse in a basic skill. These are professional athletes making millions of dollars, yet they go back to the basics each and every year and before every game. They hone their skills to insure that they are foundationally sound, so that the game to them becomes second nature. This is what God is asking each of us to do as well; get back to the basics of the Christian faith to be sure that we are Biblically sound. Most parents and churches are failing in this area! 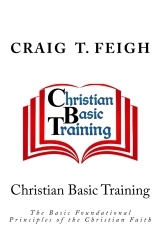 Christian Author and Speaker, Craig T. Feigh, has compiled a list of the 42 most basic Christian foundational principles in an easy-to-understand “workbook” format that allows both the new and mature Christian the ability to understand and articulate the basics of the Christian faith. It helps us to be assured of our salvation This is a must-read for anyone wanting to know the basic doctrines of the Christian faith and a must have for every Church Bible Study group. and Christian Basic Training visit Craig Feigh. A SURE way to test your faith A recent ABC poll stated that 89% of American's believe in heaven. Of these, three quarters (66%) doubted that they would ever get there physically. Are you one of them? Are you sure of your eternal destiny? Receive God's guidance every single day? Know the best way for you to live a healthy life? Find fulfillment in your work and your relationships? Be assured of honor, happiness, and a long life? Experience a deeper sense of love and intimacy? Get your of A Sure Way To Him copy at Amazon. An endearing portrait of growing up in 20th-century America All My Imperfections I Inherited From My Mom is a humorous compilation of short stories reflecting on many of the physical imperfections that all of us inherit from our parents. Many of these imperfections-allergies, hair loss, weight gain, acne, ugly toes-if taken too seriously, can lead to depression and low self-esteem. In a witty, lighthearted manner, author Craig T. Feigh reflects upon the trials and tribulations resulting from many of his youthful, inherited imperfections. Let him take you on a hilarious childhood journey of discovery and self-affirmation where the awkward moments of growing up are transformed into lessons of truth. You'll feel a new affinity for yourself and yours-imperfections and all. You may get your copy of All My Imperfections at Amazon. Craig T. Feigh, a native of Hollywood, IL, graduated from the University of Hawaii with a Bachelor of Arts Degree in Business. For several years, he has pursed a career in the telecommunications industry where he has held several Sales and Managerial level positions with some of the world's best Telecom Companies. 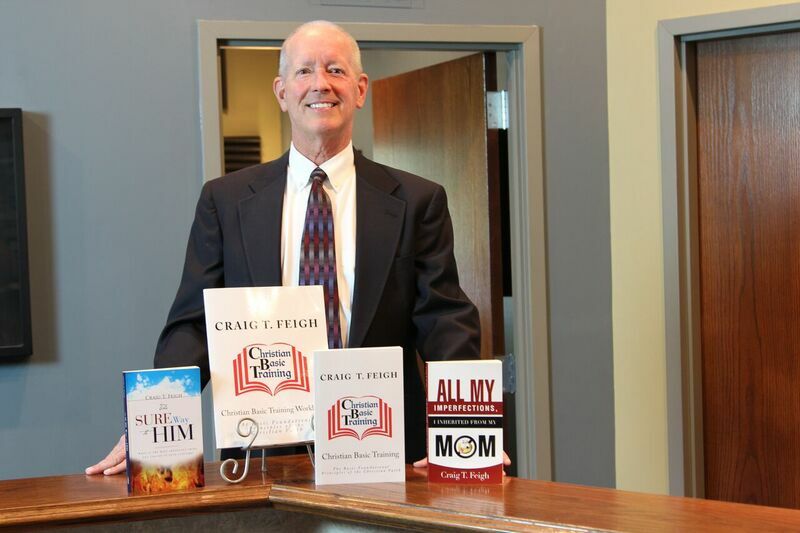 Craig's other book on the market is titled: All My Imperfections, I Inherited From My Mom. In addition to writing, Craig owns a private Christian Apparel Company and holds a US Patent for a lawn and garden tool. Craig resides in Overland Park, KS with his wife and son.